Explore Ljubljana’s history and architecture with a guided tour of the historic city center, a perfect introduction to Slovenia’s capital city. 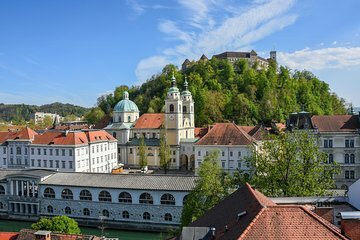 Enjoy fascinating tales of Ljubljana's dramatic past and learn about the city’s most famous landmarks and monuments from you guide. Plus, you'll enjoy a ride on Ljubljana's funicular railway, an incline cable car that shoots you up 230 vertical feet (70 vertical meters) from the city center to the Ljubljana Castle in only one minute. Our guide was very friendly and knowledgeable. She had a great personality. We saw a lot of this beautiful city and learnt the history of many memorable sites. The furnicular ride and castle visit were icing on the cake. I would recommend this tour to visitors to Ljubjana to orientate yourself. Simona was wonderful. My review should really consist of two different parts. The guided walk itself was nice. It was a cold day, so I was happy that we did not walk too long. We had a little break for snacks and to warm up. Ljubljana is a lovely little town, much worth seeing. Dont expect it to be big, though it is a capital. The tour guide was okay, though his jokes were classics and the personal interaction with the group was a bit limited. You usually dont find tour guides with worn out jeans with holes in them, maybe just a question of personal choice. The organisation of the tour part two of my review really left me quite speechless. My voucher statet 10 am for meeting. Nobody was there. I waited 20 min then called the office. Nobody picked up the phone. As the office was close by the meeting point, I went over there and talked to the lady there. Her words were Tours in winter always start at 11 I showed her the voucher. This never happened before, you are the first customer with that I showed her the current Viator trip description with 10 am on it on the internet. Yes, maybe a technical problem you notice, still not a single expression of any kind of being sorry for me. I asked her But dont you feel sorry for me that I was standing outside in the cold, waiting for 20 min? She: But that is not my fault. I said I think it is your fault too, as I called you, and nobody picked up the phone. No kidding, her response I can't always answer the phone, I got other things to do too... Yeah, whatever. The city walk is cheap, so you cant go wrong with it if you want a quick introduction the town. Better reassure the time that is printed on your voucher!